About 1.5 months ago, we finally purchased the king sized bed that we had been wanting. Woohoo! Do you know how awesome it is to have so much space for sleeping? If you don’t, I will tell you that it is absolutely amazing!!! 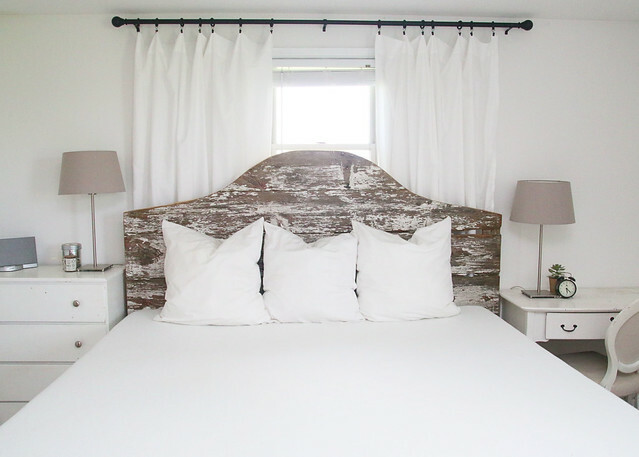 Anyway, since we already have the bed and we are working on our bedroom for the $100 Room Challenge, we decided to make a DIY Barn Wood Headboard for week 3. 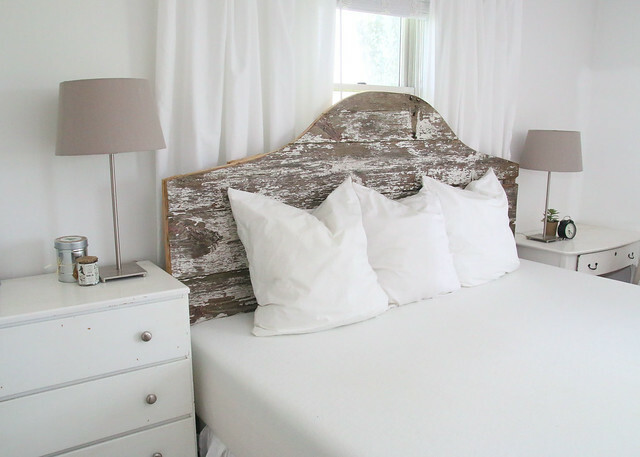 See the before pics and our plan for the master bedroom. 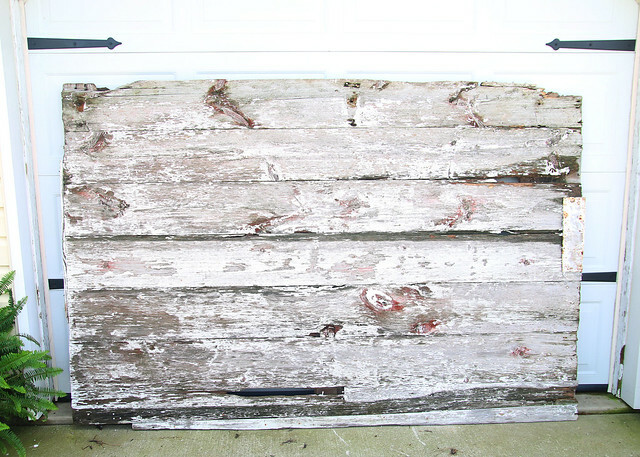 This piece of barn wood is actually a door from an old building that was at my grandparents’ house. After my grandparents passed away, my parents moved in and were nice enough to give it to us when they redid the building. It has just been sitting around waiting for the right time/use to come along. 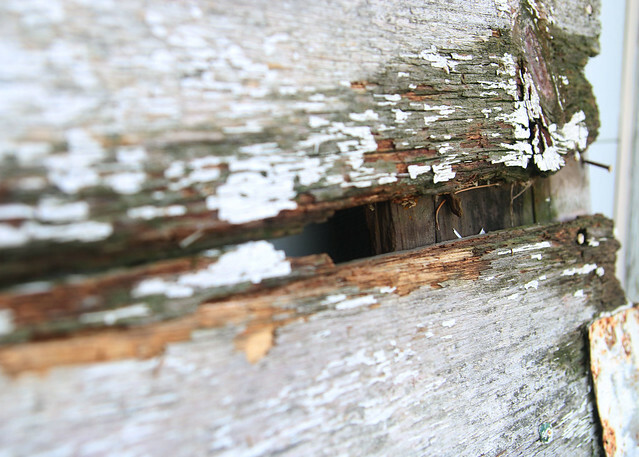 See how distressed it is, with the chippy paint and cracked wood? But that just gives it that much more character! This project was a two person job. 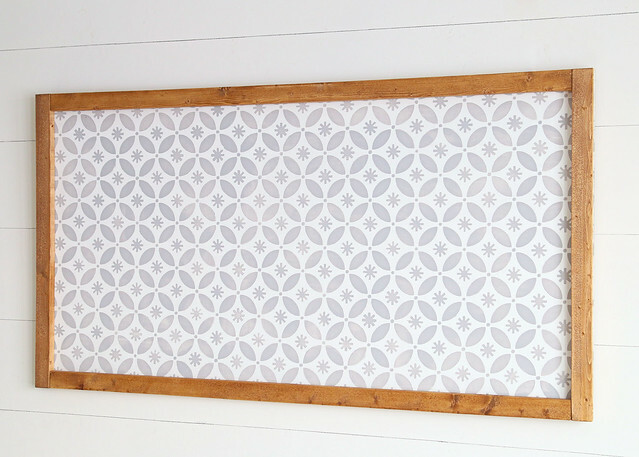 While my hubby, Chris, cleaned up the barn wood, I free handed a template for the top of the headboard. Then, I just taped it on and traced it with a sharpie. After that, Chris cut it out using a jigsaw and sanded while I made lunch. He also added a few coats of Polycrylic to seal everything in, just in case the existing paint had lead in it. Finally, we lugged it inside and put it in place. Doesn’t it look good? We noticed that after adding the Polycrylic, the wood actually darkened. I’m not sure if I will eventually add some white wash to the headboard to lighten it just a bit, but for now, we are sticking with it as is. 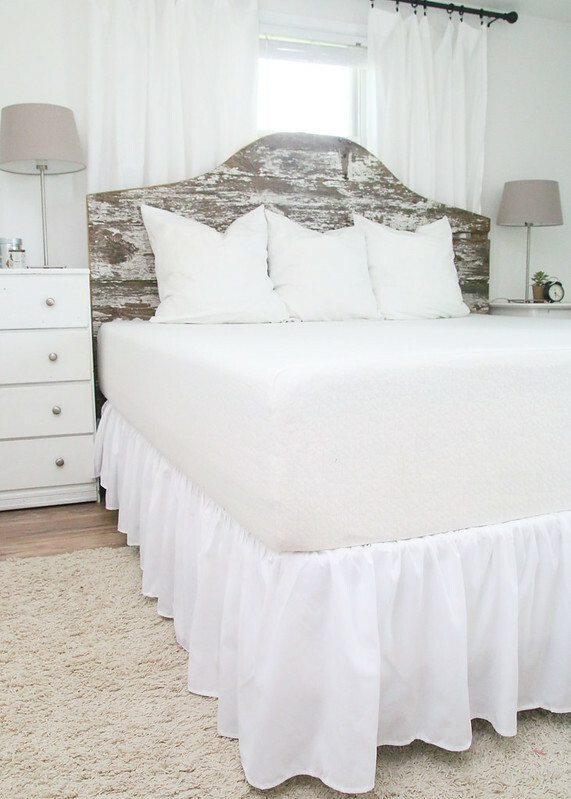 With just this one project, our master bedroom looks so much better! 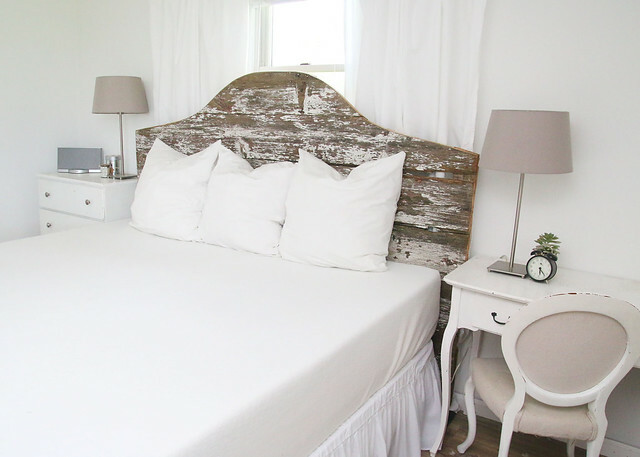 Not only are we sleeping better because of our new mattress and foundation, but this headboard really adds some farmhouse feels to the space. And that is just the look we are going for! 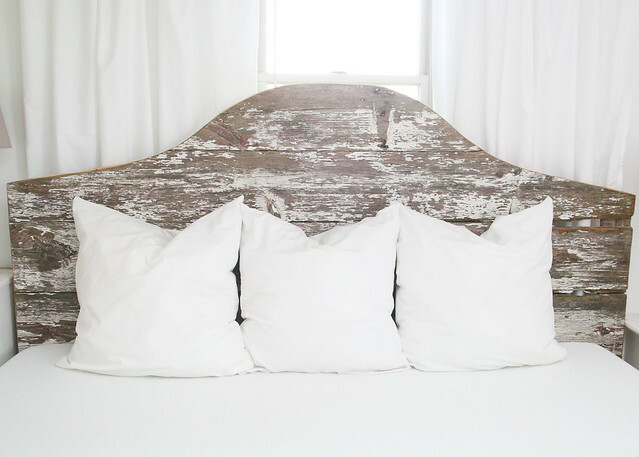 Don’t you think our DIY barn wood headboard turned out great? 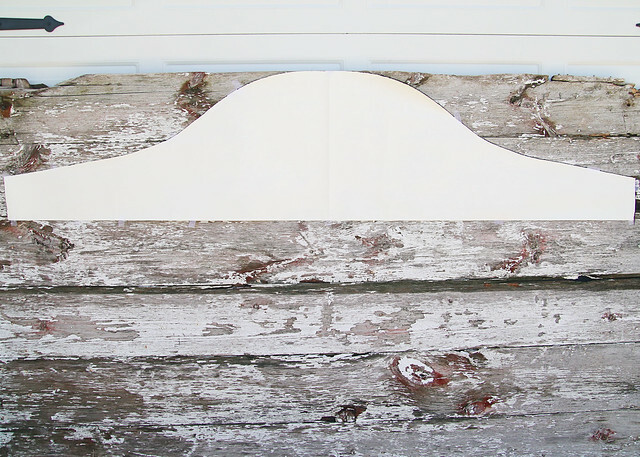 This headboard adds the perfect amount of romance to the room with the soft curve but also keeps things from getting too girly with the rustic, chippy paint. 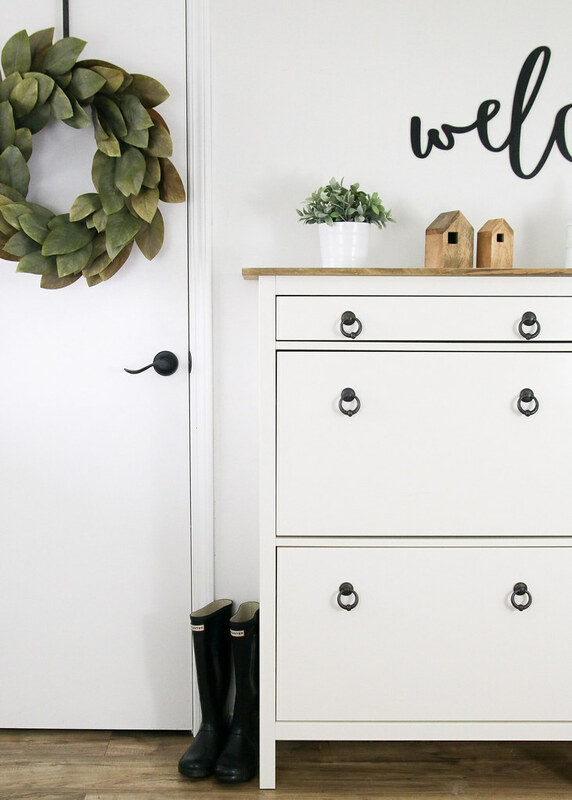 Did you miss a week of the $100 Room Challenge? Catch up now! See how the other participants are progressing by clicking the links below! 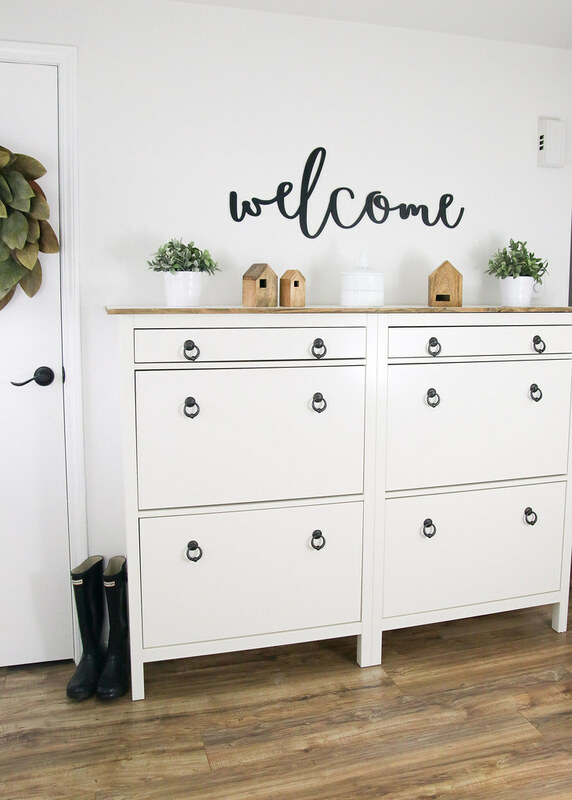 We are in the midst of week 3 of the $100 Room Challenge and we still have so much to do! 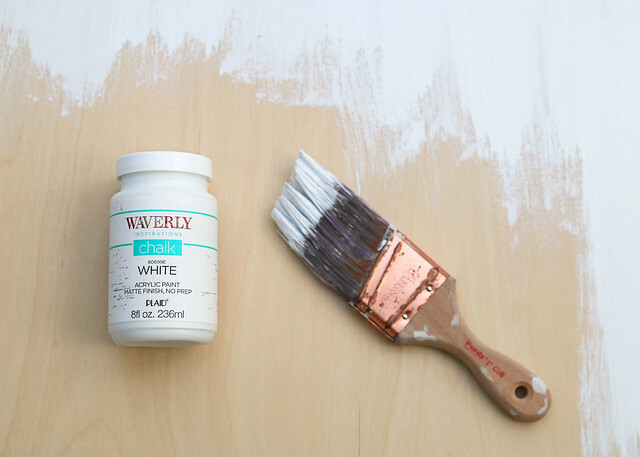 Earlier this week, I shared our plans for the room, as well as the paint colors we chose. Getting the painting done made a huge impact on the brightness in the room. We’ve made a little more bathroom progress since then, but our list still has quite a few projects on it and we are running out of time! Eek! 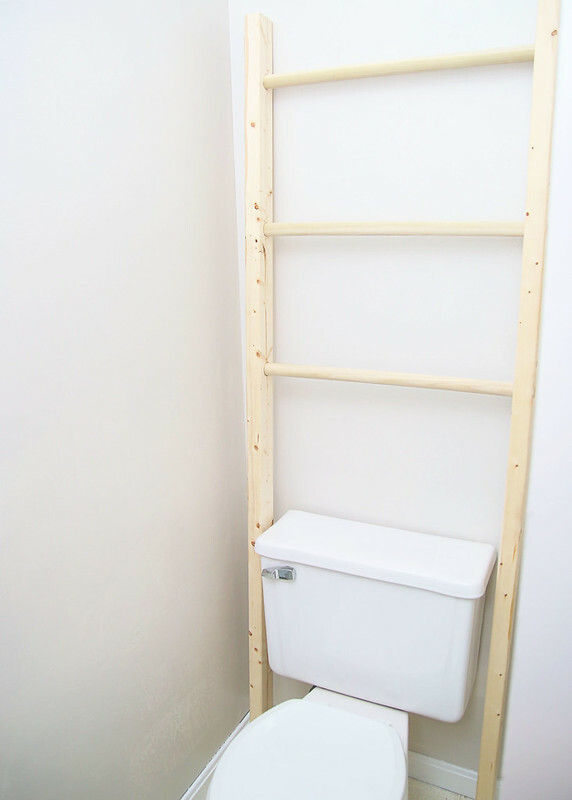 This week, we were able to build a ladder that goes around/above our toilet. 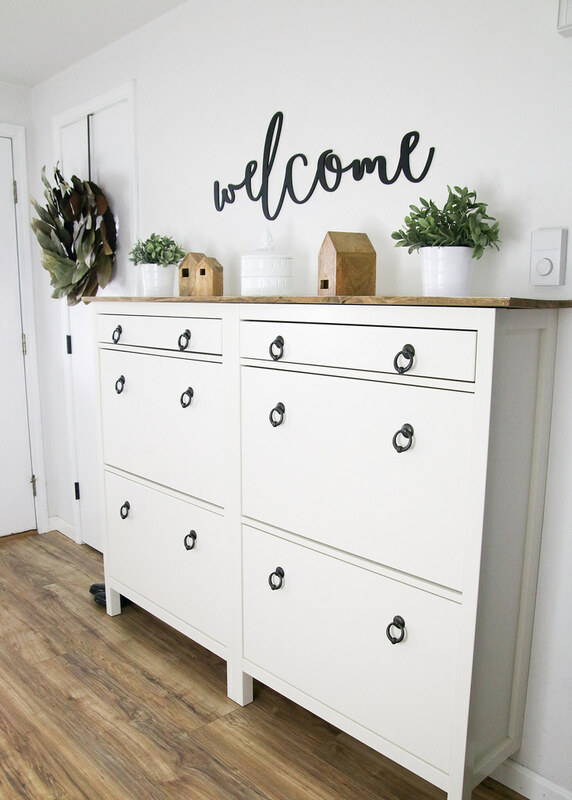 It was so easy to put together and cost us less than $5 for the wood! You may be wondering why I wanted to add a ladder to the bathroom. I’m hoping that it will bring in some color once it is stained and be a place for added storage by hanging baskets on it. 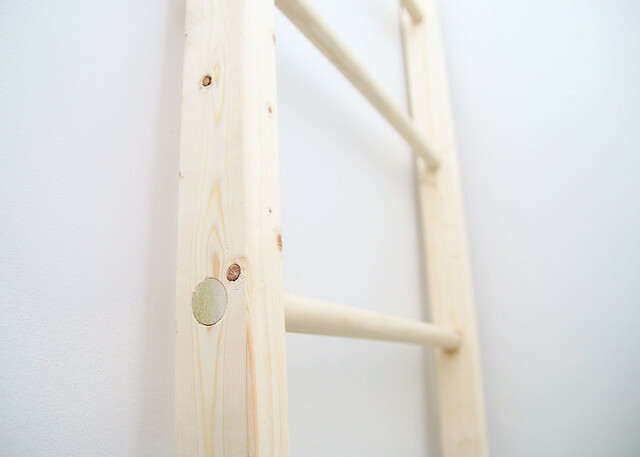 To build this puppy, we started out with 2 – 2″x3″ pine boards cut to 6′ in length and 3 – 1 1/8″ dowels cut to 24″. 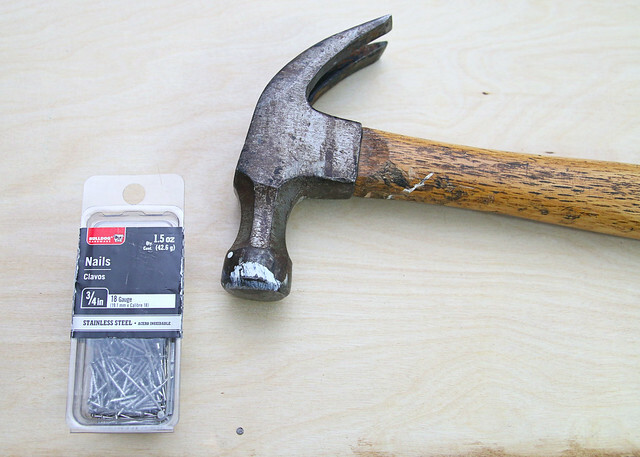 This dowel width allowed for the ladder to easily fit around the sides of our toilet tank. Then, my hubs used a 1 1/8″ paddle drill bit to create holes in the long boards and we just pushed the dowels in through the holes until they came out to the edge. So simple! I know that is not a lot of progress for this week and this coming weekend I’m heading to The Bahamas! Woohoo! 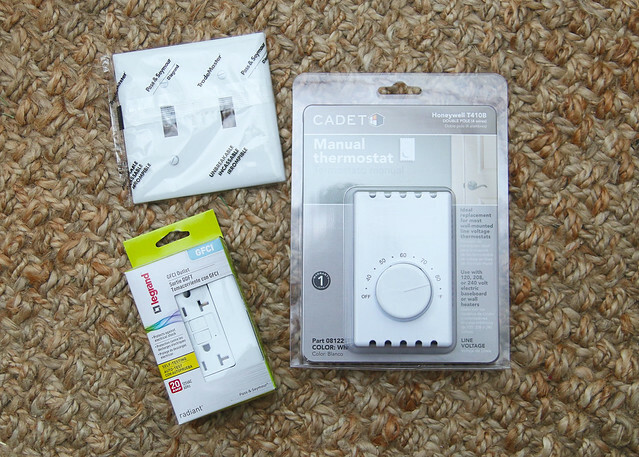 Meanwhile, my loving husband will be sticking it out at home with the kids and doing the electrical work for the bathroom. (Outlets, lighting, etc.) Then, when I get back, it will be a race to finish up the rest of the room! Let’s check on the to-do list and see how much we have left! 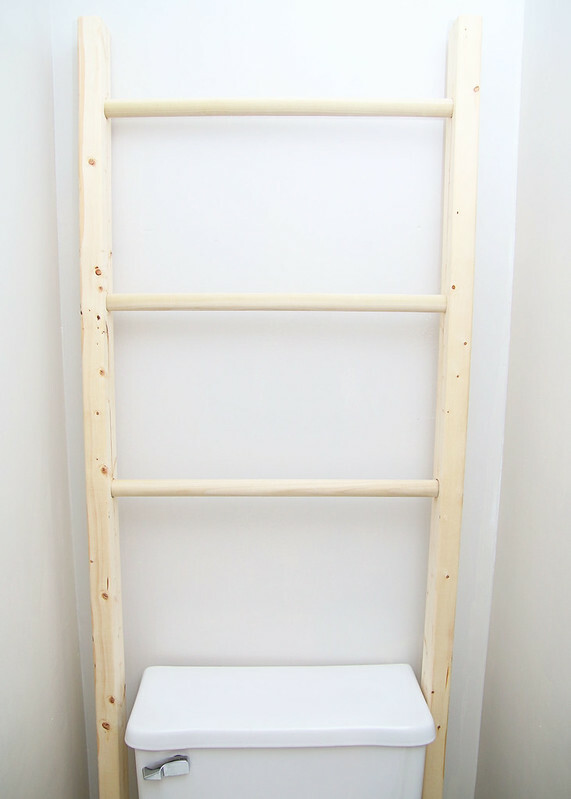 Build a ladder to put around/above the toilet. Yikes! The list is still pretty hefty. Pray for a miracle that we will be able to pull this off in time! Oh, and check out the other participants to see how their room makeovers are coming along. 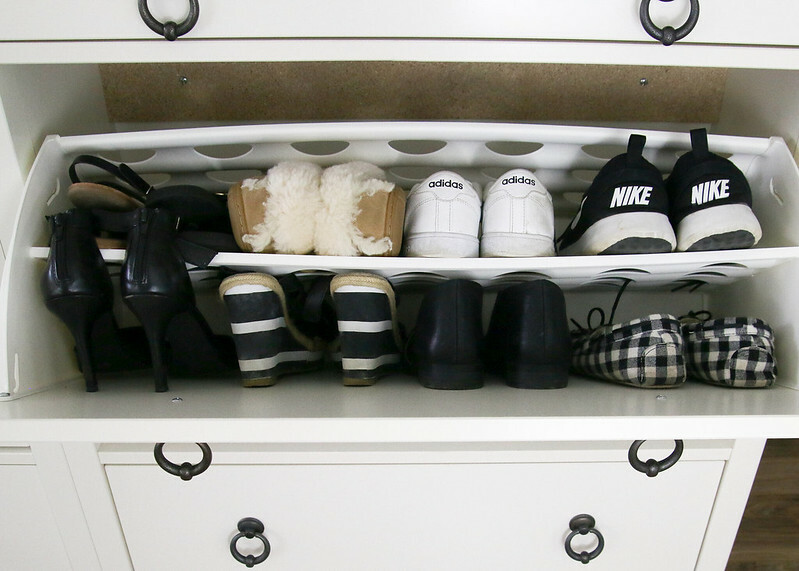 Did you miss last week’s post? Follow along with our progress by clicking the links to each week below! The holidays are almost upon us! Can you believe how fast 2016 went? Me neither. For my last attempt at holiday decor (I’ve shared my Christmas tree and entryway decor) I wanted to share this holiday wreath display that is currently hanging in our dining area. This post is brought to you by Elizabeth Joan Designs in collaboration with Cutting Edge Stencils. Although I did receive a product from Cutting Edge Stencils, all opinions are my own. Click here to view my full disclosure. So wait… what is this challenge? 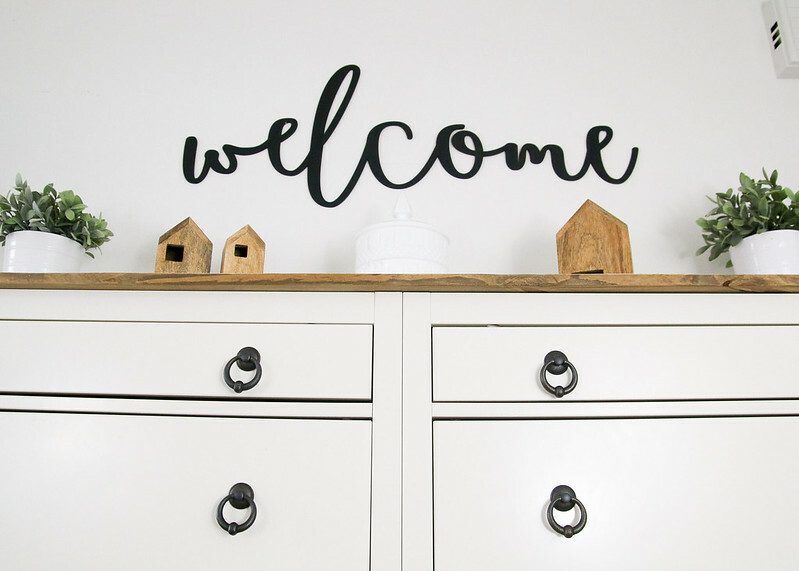 Well, participants are tasked with using their personal decor style to create a project centering around one main item. And this month, we are working with holiday stencils from Cutting Edge Stencils! 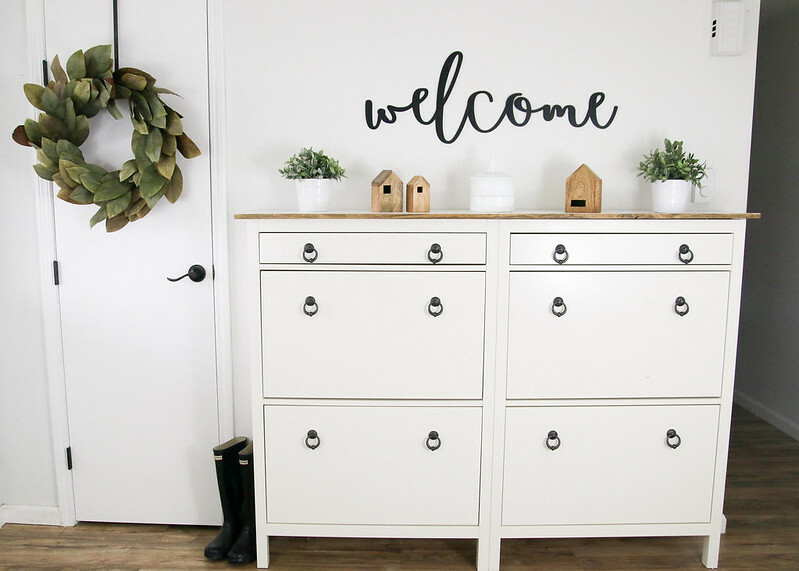 For this project, I made a fun and neutral holiday wreath display and it was so easy to create! This post contains affiliate links. Click here to view my full disclosure. 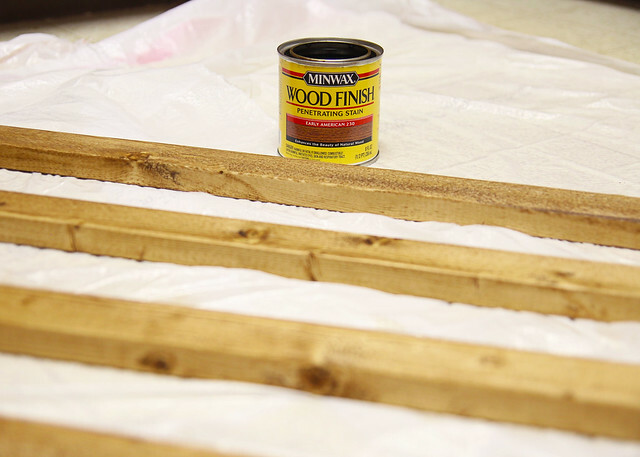 To start, I used an old rag to apply Minwax stain (Early American) to the trim pieces. While the trim pieces were drying, I painted one side of the plywood with white paint. When the white paint was dry, it was time to stencil! 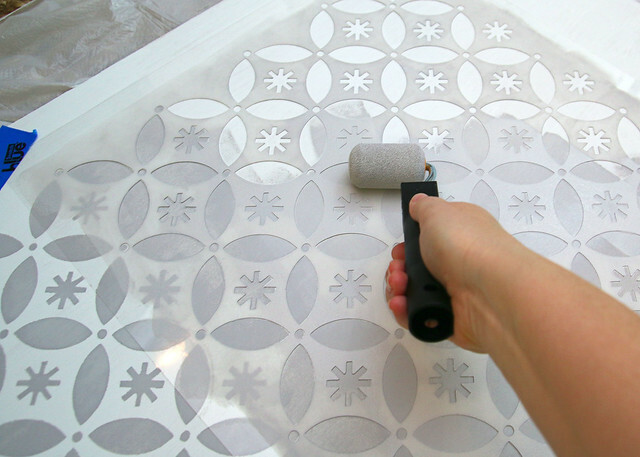 I don’t think I’ve ever used a larger stencil like this before and I could not believe how simple the process was. I simply used painter’s tape to attach the stencil to the middle of my board and used a smaller paint roller to apply the gray paint. Once I was finished with one section, I carefully pulled up the stencil and repositioned it in a new spot with part of it overlaying a previously painted section. Then, I laid the plywood on top of the frame and nailed around the back edges. You can see below that the corners of the trim were not mitered. I just put the straight edges together with the shorter pieces on the outside. 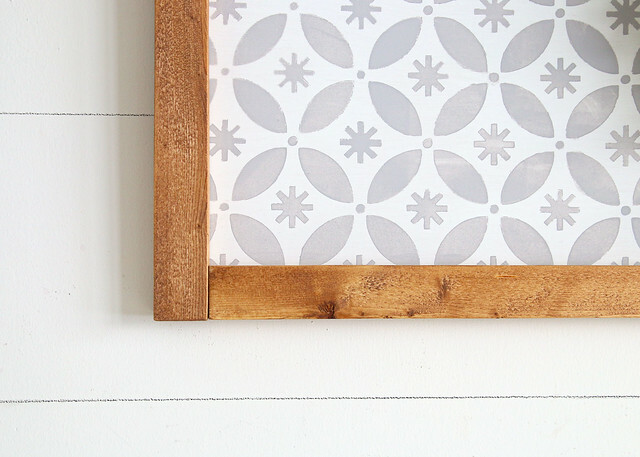 If you want to hang your creation, you can attach sawtooth picture hangers or D-rings to the back. Didn’t this turn out lovely? To finish, add your favorite wreath! 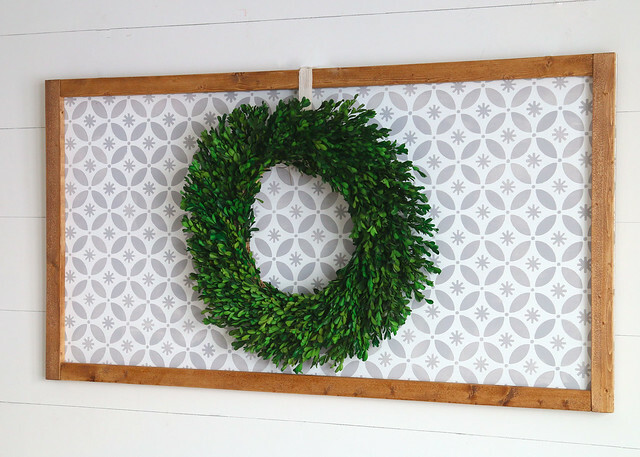 I chose a pretty boxwood wreath and attached it with a ribbon and thumb tack at the top. 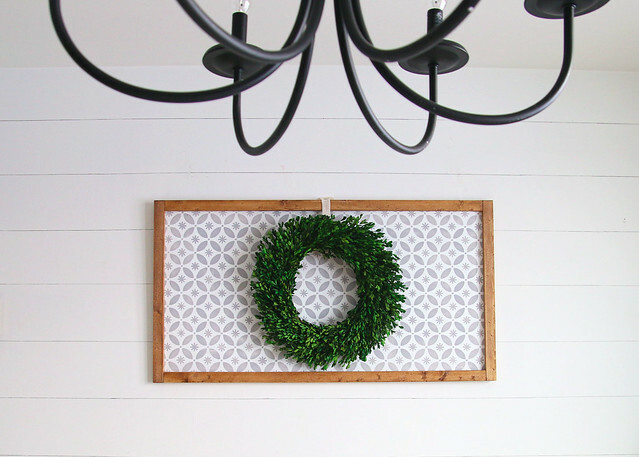 This holiday wreath display is currently hanging in our dining area and we love how it looks! You may have noticed that the dining area is starting to look a bit different. 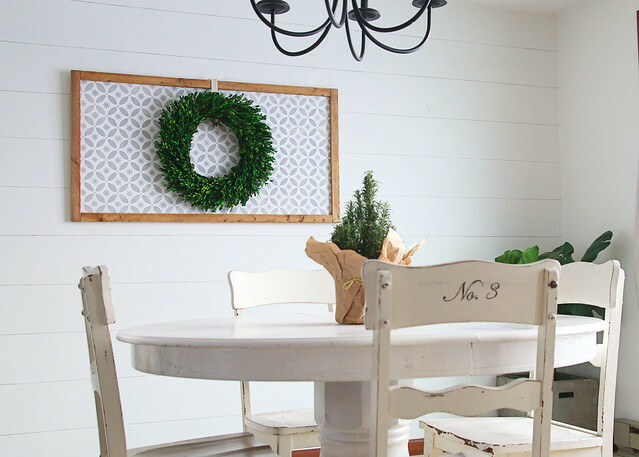 (See the before photos in our Country House Tour.) We’ve been working on it bit by bit and I will have a full update of the entire space after the holidays! One of my favorite things about this holiday wreath display is that is can be used well beyond the holiday season and into the new year! 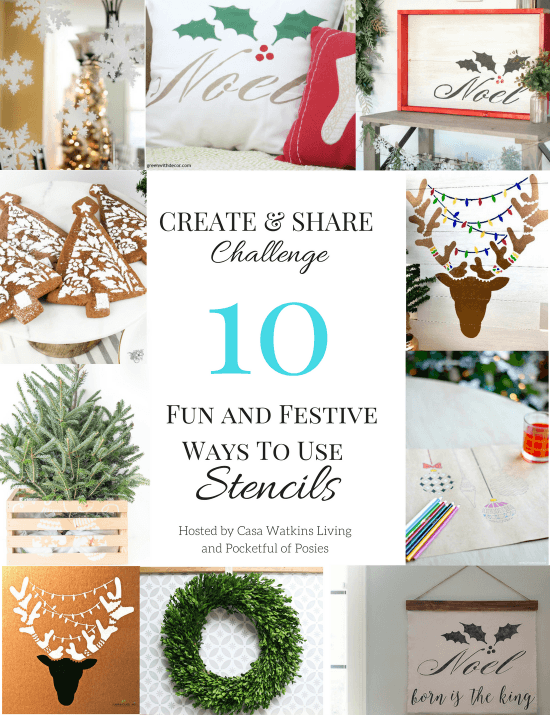 Thanks so much for stopping by to visit Elizabeth Joan Designs and don’t forget to check out the other awesome stenciled holiday creations below!